In any business school finance class you learn capital allocation techniques, whereby you reduce competing projects to a single measure in order to more easily select the capital project with the highest potential to add value to the business. Examples of these measures include NPV (or Net Present Value) which reduces multi-year cash inflows and outflows to a single value in today's dollars; and RI (Residual Income) or EVA (or Economic Value Added) which both reflect the value created from a project after achieving a required rate of return; or the more simple ROI (or Return on Investment) which is the ratio of money gained relative to money invested for a given project. Inherent in these calculations is the notion that there are alternatives for the investment of the firm's capital. There is no such thing as a good or bad rate of return in isolation. Only by comparison to alternative uses of the capital can a business deduce what investment returns the maximum long-term value. In each of these calculations assumptions must be made, particularly with regard to future cash flows. When a law firm calculates that an hourly rate increase of 10% will lead to a 10% improvement in top line revenue, the partners have assumed that other factors will remain constant, such as demand for their legal services. And in a price-insensitive (or inelastic) market, this is true. In other words, when a client is faced with the proverbial "bet the company" litigation, price is far less important than quality in the selection of outside counsel. Given constant demand, an upward adjustment in hourly fees will increase top line revenue. Similarly, a prominent legal vendor with which I have some familiarity tends to treat annual price increases as a mechanism for printing money. In one product line it issued annual price increases at about three times the CPI for a very long time, with a continuing assumption that these increases would directly correlate to increased revenues. As the business innovated to reduce internal costs, the marginal profit on the new revenues was significant, leading to a perpetual assumption that increasing prices will lead to significant increases in profits. However, each has experienced steep revenue decline and customer attrition, to the consternation of the baffled leaders. Can you spot the critical mistake made by both the law firm and the legal vendor? It's not rocket science. Obviously each overestimated the price sensitivity of the market. By assuming that buyers will continue to buy at the same pace even as the price increases, each made a fatal miscalculation. Each assumed that its product was of such high quality, was so unique and special, that buyers didn't want and wouldn't seek alternatives. Of course we now know this isn't true. BigLaw partners everywhere are getting a crash course in microeconomics. After a generation of near unlimited demand for legal services -- as close as one gets to the very definition of a mathematical constant -- clients are refusing to pay the high rates, realizing that a good portion of their legal needs are closer to commodity than "bet the company," and they're running, not walking, to find lower-cost alternatives. The legal vendor is similarly challenged. Whether it's a backlash to high prices, or the rise of alternatives and substitutes in the marketplace, buyers are pushing back, even canceling their purchases. The vendor is caught in a vicious spiral. By baking its perpetually flawed assumptions into its annual profit expectations, every cancellation or significant downward renegotiation creates a gap which it tries to make up by -- surprise! -- increasing prices to other customers or in other product lines. But law firms and legal vendors aren't unique. Every industry, even government, has its own flavor of flawed assumptions. Pharmaceutical manufacturers lobby Congress for trade protection to prevent consumers from buying lower-cost prescription drugs from Canada. The music industry laments the millions of dollars in lost CD revenue due to unauthorized music file sharing. Government officials rail about lost tax revenues from individuals and corporations aggressively seeking tax havens. In each example, buyers are doing nothing more than logically and legally seeking lower-cost alternatives. In my years leading a business, my team and I developed the most precise forecasting methodologies and as a result year after year we achieved our revenue goals while others floundered. Our approach was simple: we always included a line to reflect expected losses due to rejection of our price increases, and we developed a sophisticated predictive index to identify which buyers were at risk. Most organizations have a contingency for bad debt but this is reflected on the balance sheet and not at the product level. We were required to increase our prices by corporate mandate, even though we demonstrated time and again that it impaired our brand equity, resulted in emotional total losses (buyers who would refuse to do business with us again in any product line) and unfairly assessed penalties on good customers who didn't complain (because when the bad customers left, who do you think had to pay an even higher price to make up the difference?). The leaders were tone deaf, and today that product line has experienced monstrous losses which, in the usual manner of corporations, the present management blames on past mis-management. 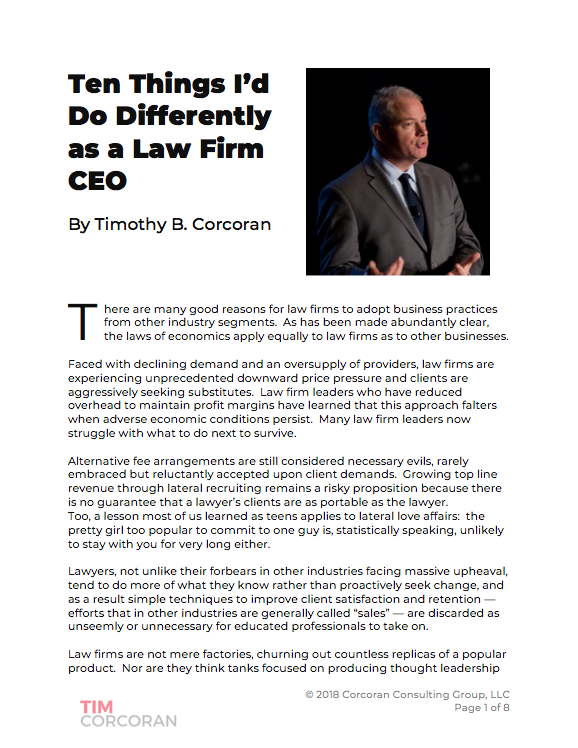 Among the many questions law firm leaders and business leaders should be asking is whether or not they have properly considered their customers' alternatives. Many BigLaw partners are astonished to learn that the pedigree of the firm truly doesn't justify fees that are substantially higher than smaller competitors in most cases. This isn't a character flaw and their myopia is shared by many others. However, those that do nothing now to address the change in circumstances should be held accountable. You don't have to be an experienced economist or financial analyst to lead a large enterprise (though it helps to have some chops). What you do need is a healthy understanding of the mathematical drivers of your success. In your revenue calculations, use different assumptions for those products and services which you can charge at any rate and those for which buyers have numerous lower-cost alternatives. Assume the services you believe to cater to a price-insensitive buyer to be shorter-lived than they used to be. Look to grow your top line as much by offering an innovative new product or service as by increasing your prices for your present offerings. When marginal profit contributions from price increases are elusive, look to achieve your profit objectives by reducing internal costs through outsourcing or business process improvement programs. But do something. "Do nothing is the choice of people who are afraid. Do nothing is what you do if too many people have to agree. Do nothing is what happens if one person with no upside has to accept downside responsibility for a change. What's in it for them to do anything? So they do nothing." In the legal marketplace we have relied on assumptions that are no longer true. We can roll up our sleeves and re-work the underlying math in our assumptions. Or we can conduct a few layoffs, cancel the annual meeting, put a freeze on hiring and travel, and wait for the old assumptions to revive. Or we can do nothing. Your call.